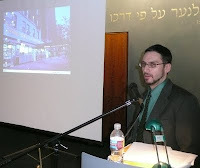 The professor had come to talk about the history of the American Jewish delicatessen as a cultural gathering place for second and third generation Jews. The crowd had come to talk corned beef, pastrami and maybe a little smoked whitefish. It was an uneasy mix, kind of like pastrami with mayo. Merwin served up the history of delis from their German antecedents through the modern survivors from gourmet shop to famed restaurants. He talked of the meaning behind the overstuffed sandwiches while the audience was clearly fondly remembering sandwiches past and wishing they could find a deli worthy of the word that could equal the delights of their New York, Chicago, Los Angeles, Florida, Toronto and even Argentinean youth. According to Merwin, and echoed by the deli devotees who came to hear him, deli food "really nurtured Jewish people in America. Something about the deli meats was at the heart of the Jewish experience." Merwin says that our remembrances of delis past has less to do about the food than they do about what the place and experience meant for us. He says we are nostalgic for delis because they are part of the American Jewish identity (you could practically hear the crowd say "amen"). He quoted a patron of the (recently resurrected -- on Third Avenue) Second Avenue Deli in New York as saying as walking in, taking a whiff of the pungent mix of dill pickles and smoked meat and saying " 'Ah, I smell Judaism.' "
Jewish delis have become "almost sacred" as a "substitute" for not just religious identity but "on par with the synagogue as a communal experience." The foods we associate with the Jewish delis -- lavish, meat-filled sandwiches, mountains of chopped liver, giant bowls of boiled chickens glistening in broth and all the rest are uniquely American, not Eastern European. Our Jewish forefathers and mothers could simply not afford to eat like this in their old countries. The first Jewish delis in America probably started about 1880s in the Lower East Side and were basically purveyors of German-Jewish brined and smoked foods. They were strictly take out. A census of the 10th ward of the Lower East Side with a population of 75,000 Jews revealed that the residents of the district could select from only 10 delicatessens, but had 131 kosher butcher shops to select from. Jews who could afford to eat out ate in cafes, saloons and, probably most often, at very inexpensive lunch counters in candy stores. The delis gain importance, according to Merwin, in the next generation, about the same time they began to gain tables and chairs and eating in at a deli became part of the Jewish landscape. This was in the 1920s and 1930s, which also accounts for the Art Deco style frequently associated with delis. Delis also spread and thrived away from the inner cities were the local Jews first arrived to the outer boroughs and other areas where the next generation moved. As delis became part of the Jewish-American scene, they became a favored "third place" to many Jews, the place outside of home and work where you could feed your hunger for casual community. It is Merwin's thesis that the assimilated sons and daughters (and grandsons and granddaughters) of immigrants felt more at home with these culturally Jewish institutions than they did in synagogue sanctuaries or social halls. "The food is less important to them then the context of community," Merwin says while his listeners' stomachs began to growl after all this talk of deli food. One could sense that they disagreed. The food seemed to be just as important to them. Merwin admitted the food was important, but it was the association of the food with the experience that created the nostalgia and longing they felt. To hear the gossip, to be insulted by the waiter (who may have been a veteran Yiddish theater or vaudeville actor), to have a sense of mastery and sense of place gave Jewish deli customers a sense of acceptance and belonging. Merwin makes a distinction between kosher delis (following the kasruth laws of food preparation including the separation of meat and milk) and those that were kosher-style (where you could have pastrami AND cheesecake). Kosher-style delis were for the most part the glitzy stars of the deli scene with sandwiches named after famous patrons and public figures (think Stage and Carnegie delis in New York). Truly kosher delis were found less frequently and played an important role in the life of the observant but did not function as frequently as this "third place" since religious observance and synagogue life retained its importance among many of their patrons. The importance of delis began to decline in many communities by the 1950s and 1960s as the food was seen as "too ethnic" and as Jewish food (such as deli meats, kosher hot dogs and rye bread) began to be mass marketed through supermarkets. As Merwin wrapped up his talk about the cultural context of delis and opened up the discussion for questions, the crowd could no longer hold back their longing for the deli meats and other treats he had discussed for the previous hour. Animated listeners demanded time to discuss their favorite delis, foods and what, to them, made the perfect Jewish deli. A disagreement broke out among several in the audience if smoked fish (whitefish and sturgeon) and lox (cured salmon) were proper deli foods. I'm glad we didn't have a show of hands of pastrami versus corned beef fans. It could have gotten ugly. See the notes below for more resources about Jewish delis. Once there is a website for Merwin's book, I'll update this post with it. All this talk of Jewish deli food made me hungry, too. I went out and bought some good bread, pastrami and the makings for chopped liver like my grandma used to make. Serve the chopped liver as an appetizer on Tam-Tams, pieces of matzoh or cocktail rye slices. Or use it to make my favorite deli sandwich, pastrami on rye with a thick shmear of chopped liver and a few ribbons of sharp deli-style mustard. Need a pickle to go with it? Try making your own. Directions are here. Grandma was kosher and therefore had to cook the livers under the broiler in order to obey the religious restrictions to remove the blood. (Other cuts of meat could be salted to accomplish the same thing.) Broiling the chicken livers gives the dish that authentic taste. This recipe makes a lot, but the chopped liver will last a few days well covered in the fridge. Feel free to halve the recipe if you'd like. A note about chicken schmaltz. It is rendered chicken fat and is available in some supermarkets, butcher stores and Jewish markets. Look in the freezer section. You can also render your own or substitute vegetable oil or shortening. Preheat the broiler and line a large baking pan with aluminium foil. Place the chicken livers in a single layer and broil (do in batches if necessary), turning once until the livers are cooked through and are a rosy brown inside. Sprinkle the cooked livers with a bit of salt. Remove the livers from the pan and put into a large bowl. Set aside. Heat schmaltz (or substitute) in a large fry pan over medium heat. Scatter the onion slices and saute until beginning to color. Add garlic. Reduce heat to medium-low and slowly cook, stirring occasionally, until the onions are caramelized. They should have a deep, rich bronze color, be very soft and have a slightly sweet taste. Set aside. Place the eggs in the bowl with the livers. Use a potato masher or fork and break them into large chunks or pieces. Add in the onions and garlic and all the schmaltz they were cooked with as well as the remaining salt and the pepper and 2 tablespoons of the wine. Mix well. Chop in batches by hand using a wooden bowl and a half-moon shaped mezzaluna chopping knife or in a food processor. Be careful not to over chop, the mixture should have a rough, slightly crumbly texture, it should not be pureed. 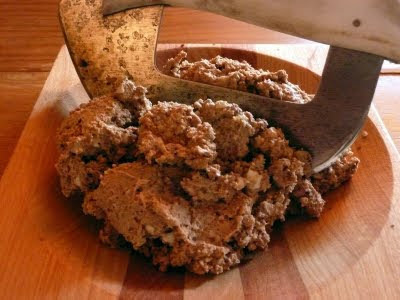 Return chopped liver mixture to bowl and combine the batches. Taste and add more salt and pepper as necessary (I probably use quite a bit more, I like it just a bit too salty so it compensates for the blander cracker or matzo.) If the mixture is too dry, you could add a bit more of the wine. Then, essen min kinder (Yiddish for dig in). More background on the history and future of the Jewish deli can be found here on Serious Eats. Author David Sax is trying to save delis one sandwich at a time. You can find out more about his efforts and book on Save the Deli. For a list of commendable Jewish delis worth the calories in NY (and in the comments section elsewhere), click here. About the photos: Top, freshly chopped chicken liver like Grandma used to make. The other photo is of Ted Merwin during his lecture at the Bureau of Jewish Education on 9/30/09 in San Francisco. 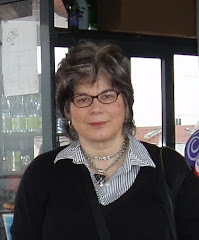 Update: More on delis from around the web: Bitten blog and Joan Nathan in the New York Times. Update 6/11: See a discussion on the recent Deli Summit about the future of the food and the institution on Zester. Thanks for an entertaining and educational read. I loved the humor, particularly the subtitle on the chopped liver recipe. I didn't know you could be so funny. You can claim to be on the same wavelength as the NY Times today with their piece by Joan Nathan. Thanks for linking to this post, Sam. I appreciate it. Dianne, thanks for your thoughtful comment. I appreciate your take on the changes I'm trying to bring to Blog Appetit. I'd also like to thank Ted Merwin for his kind email. I really enjoyed reading this blog post. I grew up in Miami Beach and experienced the sense of community in a local Jewish deli. Sandwiches piled high, fresh table side pickles and condiments. Lime Rickeys, seltzer water,etc. Next month we are heading to NYC and are planning to take in at least two authentic NYC Jewish delis. Thanks for sharing this history. SO COOL. Wish I would have known about the lecture, would totally have attended. Velva, I used to love lime rickeys! Be sure to let me know about your NY deli experience. Neen, watch for talks the end of this month in SF by David Sax, author of the Save the Deli blog and book.